I have a new taggers sized freebie to give away as well. 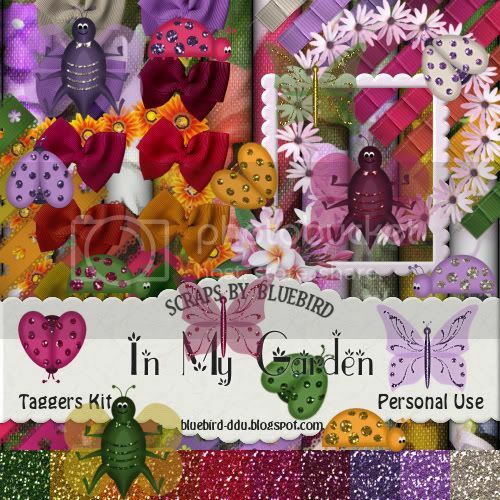 This one is a little different - all the papers are made from photographs taken in my garden and of course there are some glitterbugs in there lol. Hope you like it. Thank you so much for this Freebie. I want to let you know that I posted a link to your blog in Creative Busy Hands Scrapbook Freebies Search List, under the Spring Theme post on Feb. 16, 2009. Thanks again. Thank you for the kit, it is really cute,love the bugs. Awesome kit, thanks so much!!! Thank you very much Bluebird for your generosity in creating and sharing your fantastic feebies. thanks for sharing this adorable kit!